This episode was unremarkable in a number of ways that I do not care to elucidate. We have the character of Margot thrown in, an unnecessary and late-coming red herring if there ever was one. Like most of the women in this show, she merely acts as a soundboard to the male characters, in this case Hannibal. 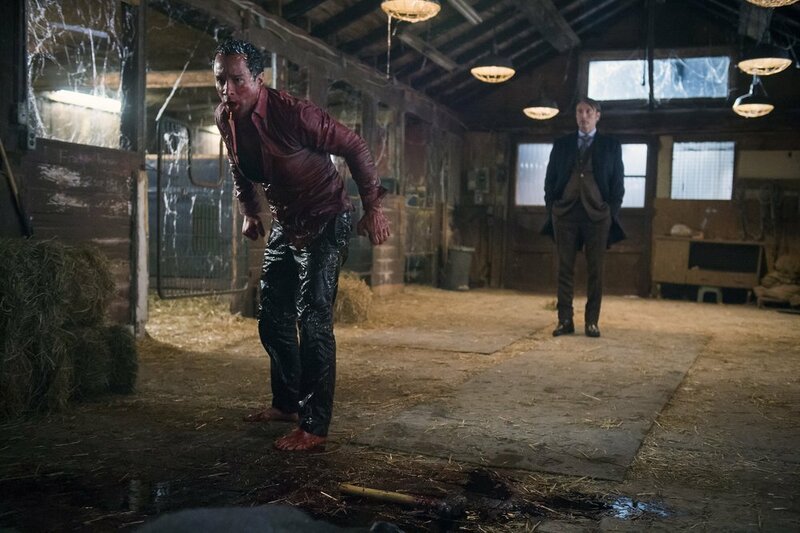 As if to beat a dead horse (ha ha), we also have gratuitous (and not in terms of skin shown) scenes between Hannibal and Dr. Bloom, who has become yet another glass fawn in Lecter’s menagerie. The dance between Will and Hannibal starts off slow enough in the episode and remains at an agonizingly slow tempo throughout; we learn no new information about their relationship. We head no further down the road of resolution, as we soon should given there are but five episodes left. We still, as I dutifully remind, need to catch up to the frame that opened the season between Jack and Hannibal. The whole business with Will attempting to kill the social worker sociopath on behalf of the brain-damaged man was abysmal; Hannibal’s explanation of the event concurrent to its unfolding was equally banal. Unless we’re to learn something new through all of this madness, I don’t see the point. The image of the live bird inside the dead woman inside the dead horse was disarming, but just that. We need to get back to the solid storyline: Hannibal’s eventual discovery and the chase. Throwing in characters at the last minute doesn’t bode well for the arc of the storyline. Let’s hope the story gods bring us back around this Friday.